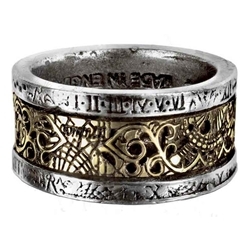 The Dr Von Rosensteins Induction Principle Ring is made of pewter and solid brass, an authentic reproduction of Dr. Von Rosensteins indispensable key to the induction matrix. This Gothic ring has a bright, gleaming finish. An advantage of this pewter Dr Von Rosensteins Induction Principle ring is that it does not need regular polishing to maintain its gorgeous appearance. Pewter jewelry does not tarnish like silver jewelry. To keep your gothic Dr Von Rosensteins Induction Principle ring bright and shiny, an occasional cleaning with a quality proprietary metal polish will keep it looking brilliant. This pewter gothic ring is made in Sheffield, England and crafted by master craftsman, who are members of The Worshipful Company of Pewterers. This group was granted a charter in 1474 by King Edward IV for the legal manufacture of pewter rings throughout England. Many of the ancient pewter smithing skills are still utilized today. They are the only manufacturer of high quality rings in their gothic collection of fine pewter jewelry.